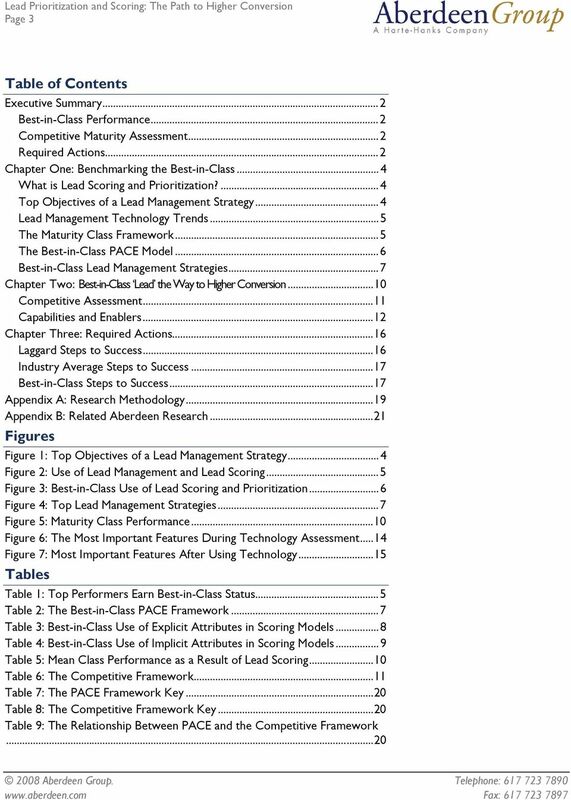 Download "Lead Prioritization and Scoring"
9 Page 9 Aberdeen Insights Lead Scoring Tactics Table 4: Best-in-Class Use of Implicit Attributes in Scoring Models Ranking Key Not Important Very Important Median Rank (Importance to Scoring Model) Percent Not Using Attribute in Scoring Model Webinars attended % Purchase propensity scores % click-throughs % Website activity (pages visited and recency) % Website activity (type of activity) % Keywords clicked % Website activity (length of time each page was visited) % Attitudinal and lifestyle information % On average, 21% of the Best-in-Class do not use one or more of these metrics. 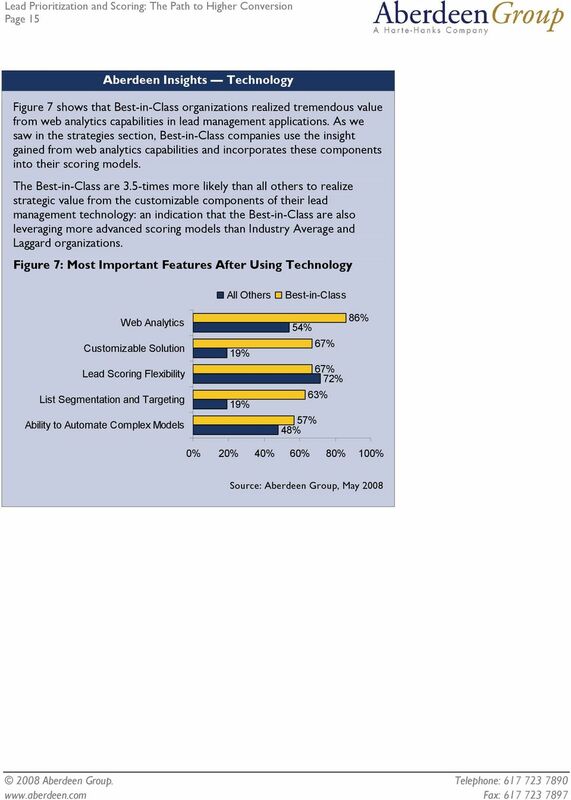 However, this does not make these attributes any less important to optimizing the lead scoring model. One very important component to tracking implicit attributes that is not mentioned in Table 4 is the prospects "activity over baseline." This measurement provides context for determining the relative importance of a prospects activity based on the historical "baseline" behavior of this prospect. Table 4 also demonstrates that despite having technology in place to automate the capture of implicit and explicit information, Best-in-Class companies still do not consider implicit sources of information to be as important. 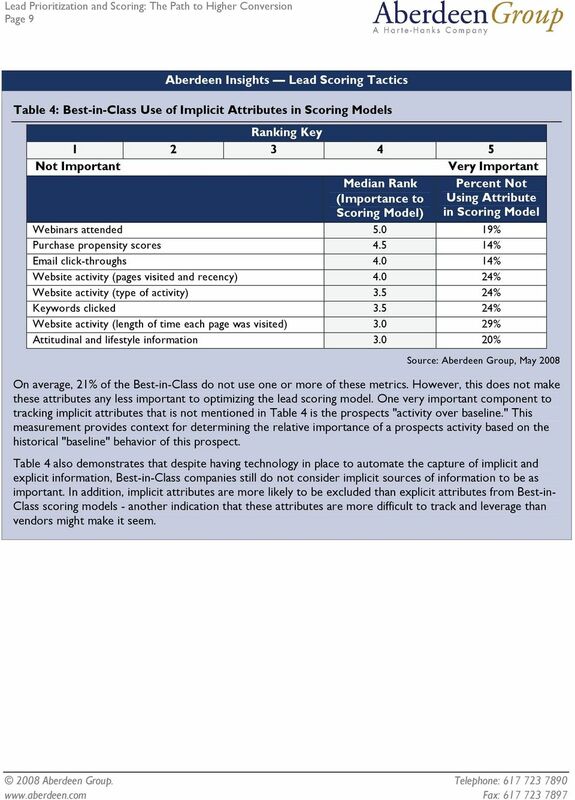 In addition, implicit attributes are more likely to be excluded than explicit attributes from Best-in- Class scoring models - another indication that these attributes are more difficult to track and leverage than vendors might make it seem. 18 Page 18 developing initiatives to enhance conversion from nurturing campaigns through cross-selling and up-selling initiatives. Leverage implicit attributes in lead scoring models. 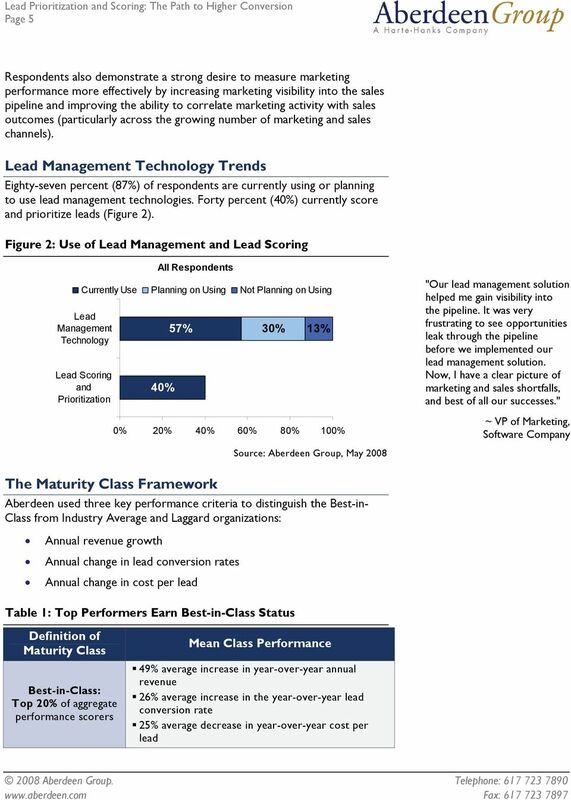 The research demonstrated that Best-in-Class companies were 13-times more likely than their peers to leverage three or more implicit attributes in lead scoring models. 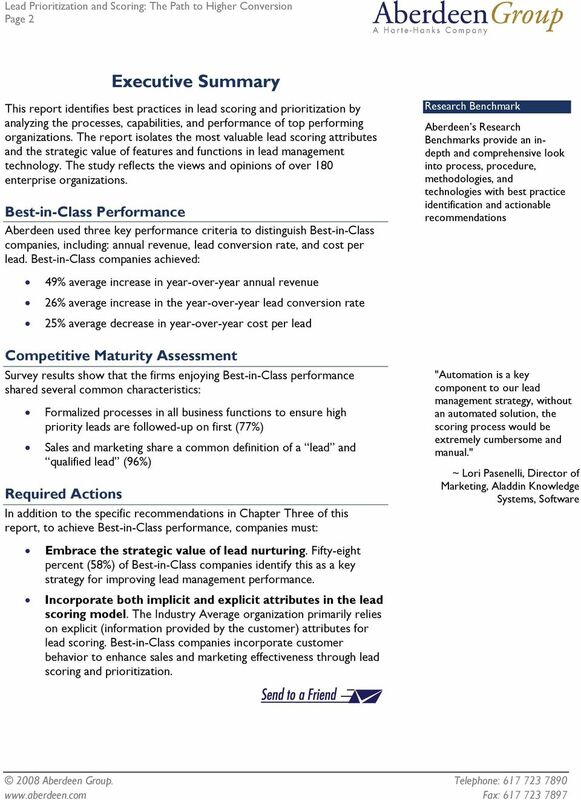 Deeper analysis also showed that the highest performing Best-in-Class organizations indicated they had more complex scoring models than their Best-in-Class peers. 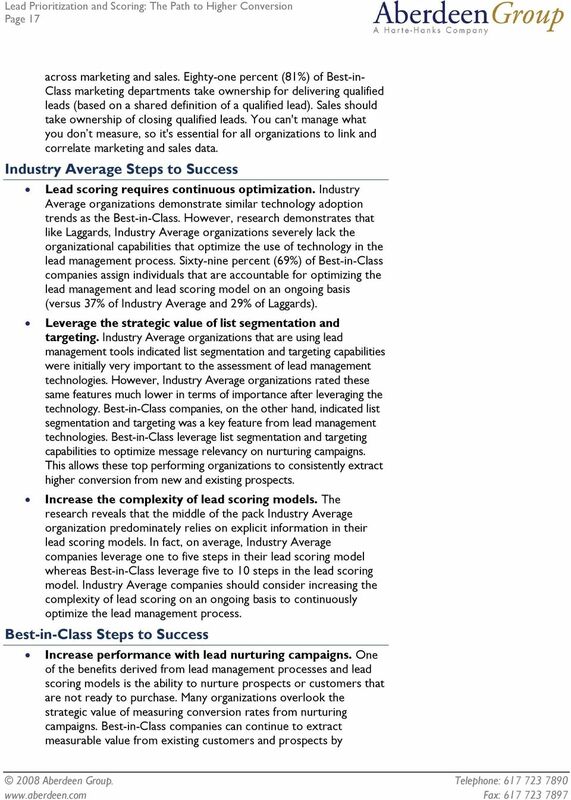 For most of the implicit attributes that were included in the Aberdeen survey, only three quarters of the Best-in-Class actually leveraged these attributes in scoring models. In addition, on average, the Best-in-Class rarely rated implicit scoring attributes as extremely important to their lead scoring processes. The Best-in- Class can continue to optimize lead scoring models by leveraging implicit metrics (such as time spent on the website or keyword click-throughs) to help optimize both the lead scoring model, as well as marketing effectiveness. The research clearly demonstrates the value of taking a holistic approach to lead management. 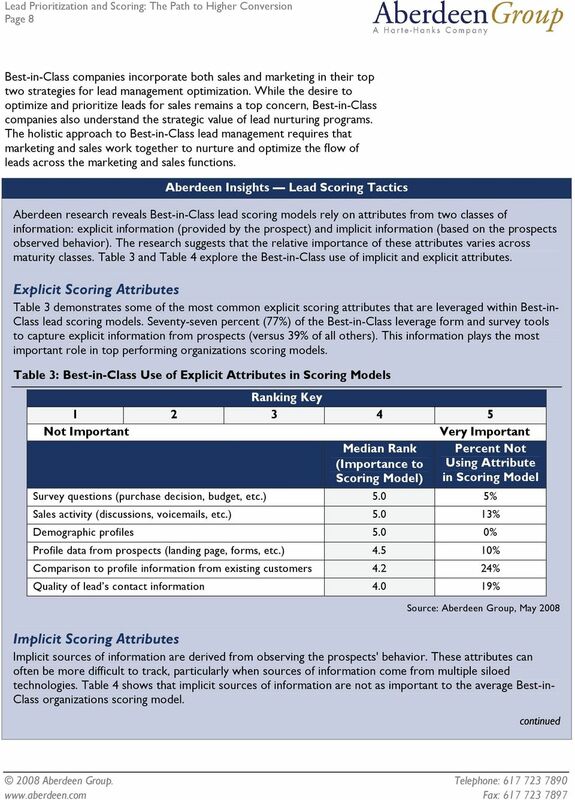 Aberdeen explored the specific components of lead scoring to isolate key implicit and explicit attributes that have the largest impact on Best-in-Class lead scoring. 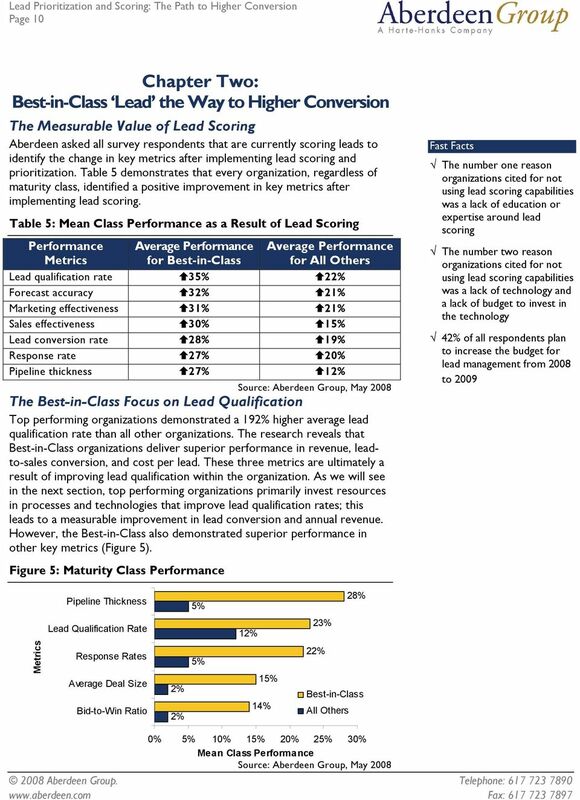 Research also revealed that top performing companies are leveraging lead scoring and prioritization techniques far more extensively than Industry Average and Laggard organizations. 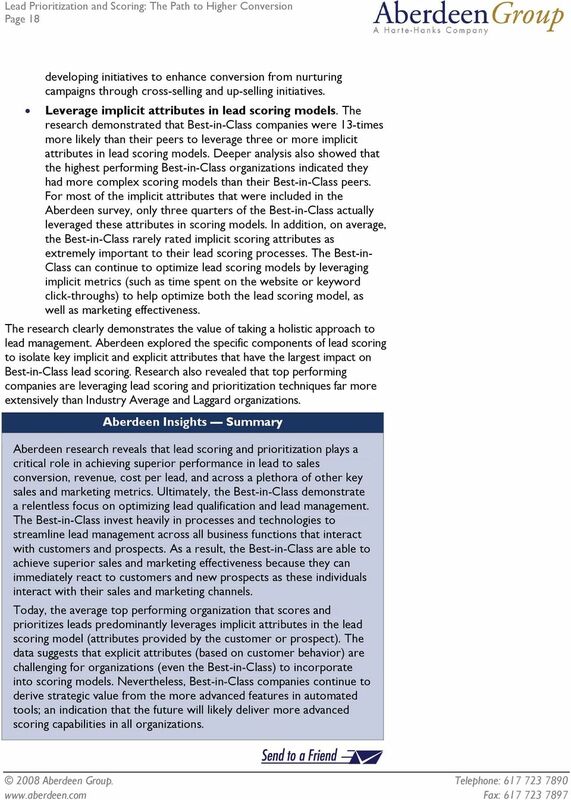 Aberdeen Insights Summary Aberdeen research reveals that lead scoring and prioritization plays a critical role in achieving superior performance in lead to sales conversion, revenue, cost per lead, and across a plethora of other key sales and marketing metrics. 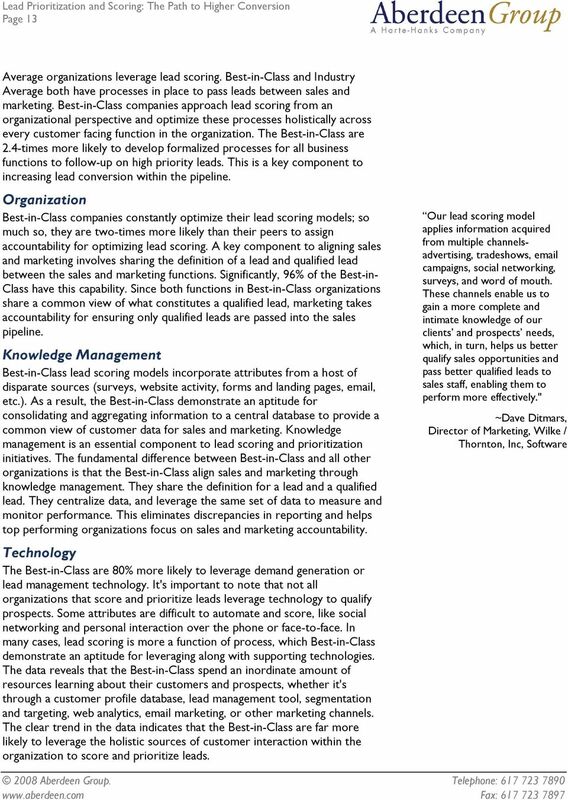 Ultimately, the Best-in-Class demonstrate a relentless focus on optimizing lead qualification and lead management. The Best-in-Class invest heavily in processes and technologies to streamline lead management across all business functions that interact with customers and prospects. As a result, the Best-in-Class are able to achieve superior sales and marketing effectiveness because they can immediately react to customers and new prospects as these individuals interact with their sales and marketing channels. Today, the average top performing organization that scores and prioritizes leads predominantly leverages implicit attributes in the lead scoring model (attributes provided by the customer or prospect). The data suggests that explicit attributes (based on customer behavior) are challenging for organizations (even the Best-in-Class) to incorporate into scoring models. Nevertheless, Best-in-Class companies continue to derive strategic value from the more advanced features in automated tools; an indication that the future will likely deliver more advanced scoring capabilities in all organizations. 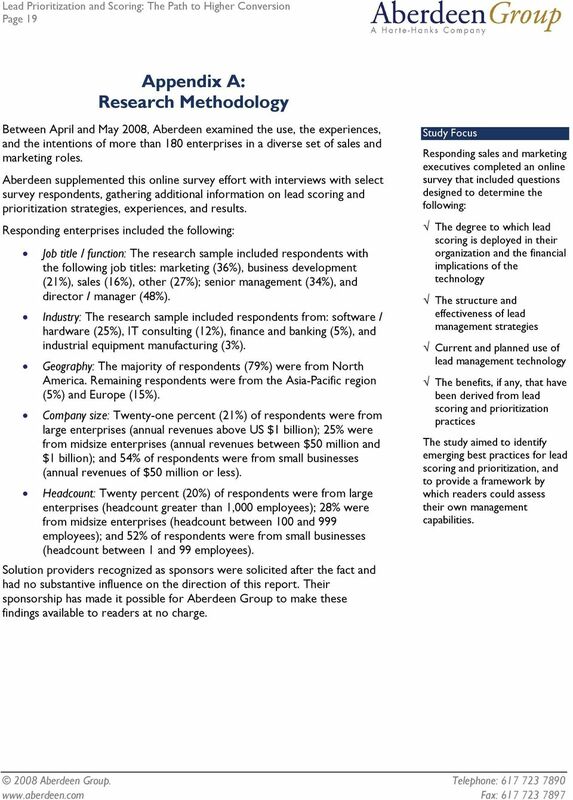 19 Page 19 Appendix A: Research Methodology Between April and May 2008, Aberdeen examined the use, the experiences, and the intentions of more than 180 enterprises in a diverse set of sales and marketing roles. Aberdeen supplemented this online survey effort with interviews with select survey respondents, gathering additional information on lead scoring and prioritization strategies, experiences, and results. Responding enterprises included the following: Job title / function: The research sample included respondents with the following job titles: marketing (36%), business development (21%), sales (16%), other (27%); senior management (34%), and director / manager (48%). Industry: The research sample included respondents from: software / hardware (25%), IT consulting (12%), finance and banking (5%), and industrial equipment manufacturing (3%). Geography: The majority of respondents (79%) were from North America. Remaining respondents were from the Asia-Pacific region (5%) and Europe (15%). Company size: Twenty-one percent (21%) of respondents were from large enterprises (annual revenues above US $1 billion); 25% were from midsize enterprises (annual revenues between $50 million and $1 billion); and 54% of respondents were from small businesses (annual revenues of $50 million or less). Headcount: Twenty percent (20%) of respondents were from large enterprises (headcount greater than 1,000 employees); 28% were from midsize enterprises (headcount between 100 and 999 employees); and 52% of respondents were from small businesses (headcount between 1 and 99 employees). Solution providers recognized as sponsors were solicited after the fact and had no substantive influence on the direction of this report. Their sponsorship has made it possible for Aberdeen Group to make these findings available to readers at no charge. 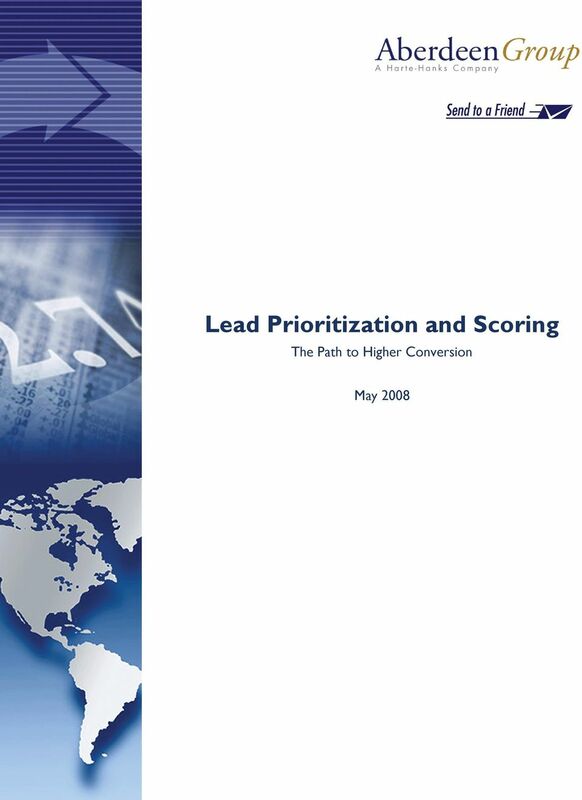 Study Focus Responding sales and marketing executives completed an online survey that included questions designed to determine the following: The degree to which lead scoring is deployed in their organization and the financial implications of the technology The structure and effectiveness of lead management strategies Current and planned use of lead management technology The benefits, if any, that have been derived from lead scoring and prioritization practices The study aimed to identify emerging best practices for lead scoring and prioritization, and to provide a framework by which readers could assess their own management capabilities. 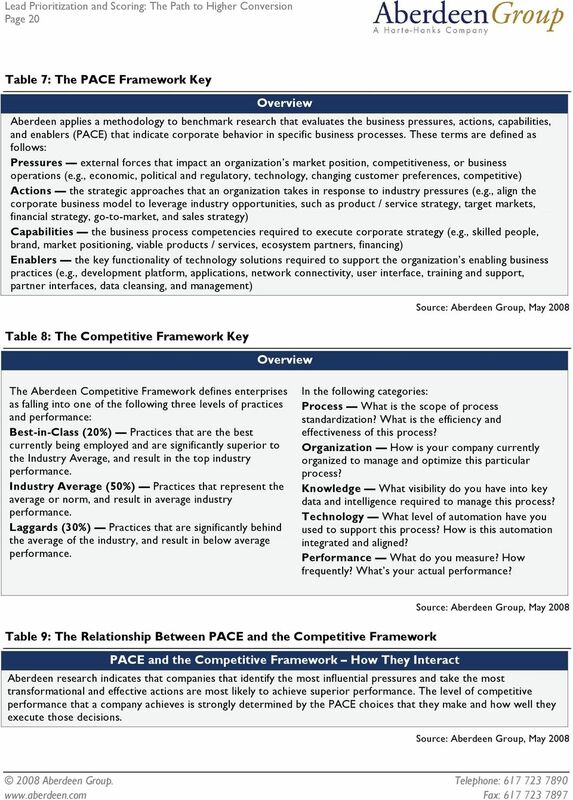 20 Page 20 Table 7: The PACE Framework Key Overview Aberdeen applies a methodology to benchmark research that evaluates the business pressures, actions, capabilities, and enablers (PACE) that indicate corporate behavior in specific business processes. These terms are defined as follows: Pressures external forces that impact an organization s market position, competitiveness, or business operations (e.g., economic, political and regulatory, technology, changing customer preferences, competitive) Actions the strategic approaches that an organization takes in response to industry pressures (e.g., align the corporate business model to leverage industry opportunities, such as product / service strategy, target markets, financial strategy, go-to-market, and sales strategy) Capabilities the business process competencies required to execute corporate strategy (e.g., skilled people, brand, market positioning, viable products / services, ecosystem partners, financing) Enablers the key functionality of technology solutions required to support the organization s enabling business practices (e.g., development platform, applications, network connectivity, user interface, training and support, partner interfaces, data cleansing, and management) Table 8: The Competitive Framework Key Overview The Aberdeen Competitive Framework defines enterprises as falling into one of the following three levels of practices and performance: Best-in-Class (20%) Practices that are the best currently being employed and are significantly superior to the Industry Average, and result in the top industry performance. Industry Average (50%) Practices that represent the average or norm, and result in average industry performance. 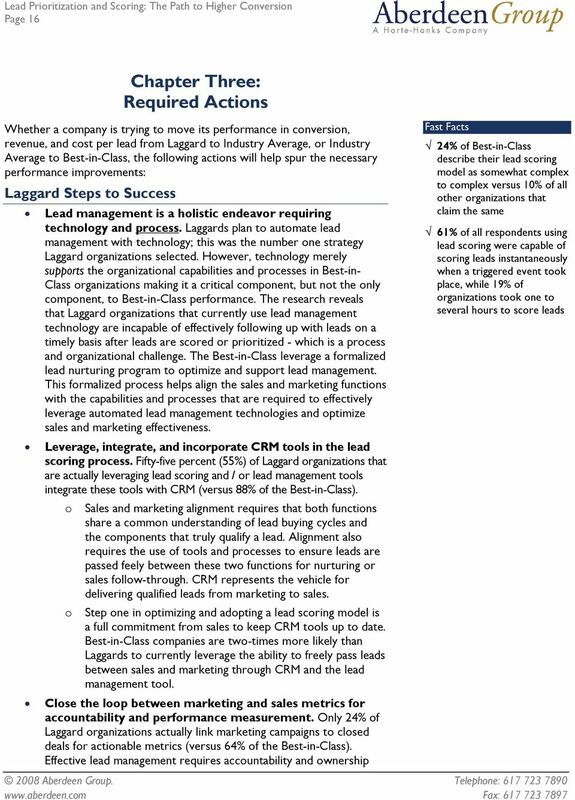 Laggards (30%) Practices that are significantly behind the average of the industry, and result in below average performance. In the following categories: Process What is the scope of process standardization? What is the efficiency and effectiveness of this process? Organization How is your company currently organized to manage and optimize this particular process? Knowledge What visibility do you have into key data and intelligence required to manage this process? Technology What level of automation have you used to support this process? How is this automation integrated and aligned? Performance What do you measure? How frequently? What s your actual performance? Table 9: The Relationship Between PACE and the Competitive Framework PACE and the Competitive Framework How They Interact Aberdeen research indicates that companies that identify the most influential pressures and take the most transformational and effective actions are most likely to achieve superior performance. The level of competitive performance that a company achieves is strongly determined by the PACE choices that they make and how well they execute those decisions. 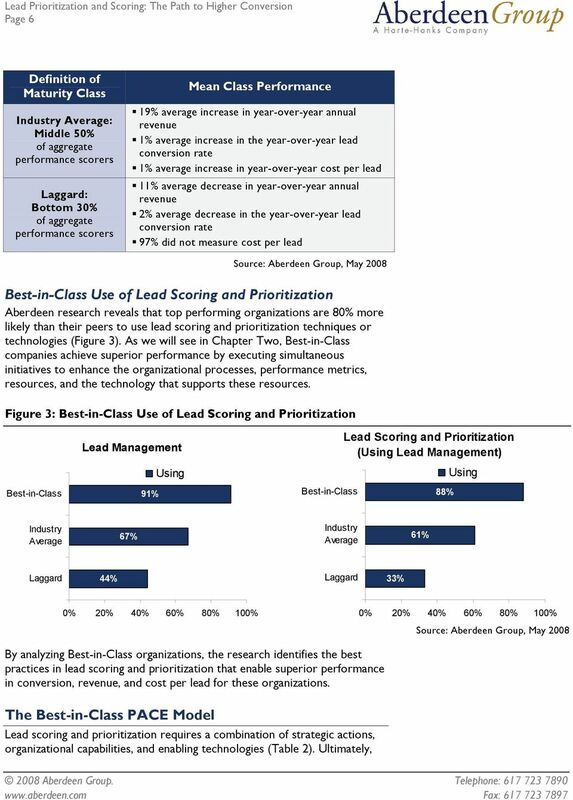 21 Page 21 Appendix B: Related Aberdeen Research Related Aberdeen research that forms a companion or reference to this report includes: B2B TeleServices: The 2008 Buyer's Guide; April 2008 The CMO Strategic Agenda: Automating Closed Loop Marketing; March 2008 CMO Strategic Agenda: Demystifying ROI in Marketing; February 2008 The Convergence of Sales and Marketing Technologies; December 2007 Demand Generation: Kick-Start Your Business; September 2007 Success Strategies in Marketing Automation; July 2007 Automating Leads to Sales; March 2007 Information on these and any other Aberdeen publications can be found at Author: Ian Michiels, Sr. Research Analyst, Customer Management Technology Group, Since 1988, Aberdeen's research has been helping corporations worldwide become Best-in-Class. Having benchmarked the performance of more than 644,000 companies, Aberdeen is uniquely positioned to provide organizations with the facts that matter the facts that enable companies to get ahead and drive results. That's why our research is relied on by more than 2.2 million readers in over 40 countries, 90% of the Fortune 1,000, and 93% of the Technology 500. As a Harte-Hanks Company, Aberdeen plays a key role of putting content in context for the global direct and targeted marketing company. 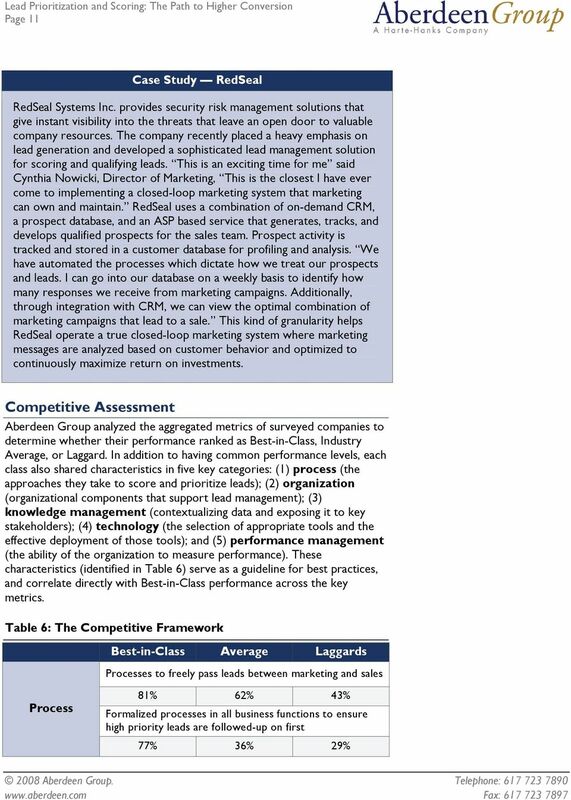 Aberdeen's analytical and independent view of the "customer optimization" process of Harte- Hanks (Information Opportunity Insight Engagement Interaction) extends the client value and accentuates the strategic role Harte-Hanks brings to the market. For additional information, visit Aberdeen or call (617) , or to learn more about Harte-Hanks, call (800) or go to This document is the result of primary research performed by Aberdeen Group. Aberdeen Group's methodologies provide for objective fact-based research and represent the best analysis available at the time of publication. Unless otherwise noted, the entire contents of this publication are copyrighted by Aberdeen Group, Inc. and may not be reproduced, distributed, archived, or transmitted in any form or by any means without prior written consent by Aberdeen Group, Inc. 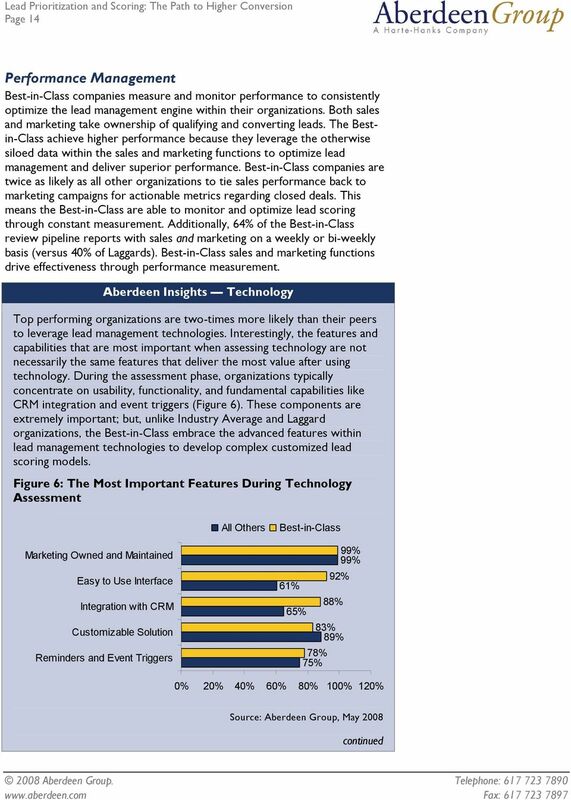 The CMO Strategic Agenda: Automating Closed-Loop Marketing March 2008 Page 2 Executive Summary Aberdeen surveyed 315 enterprises to identify current closed-loop marketing challenges, tactics, and strategies. 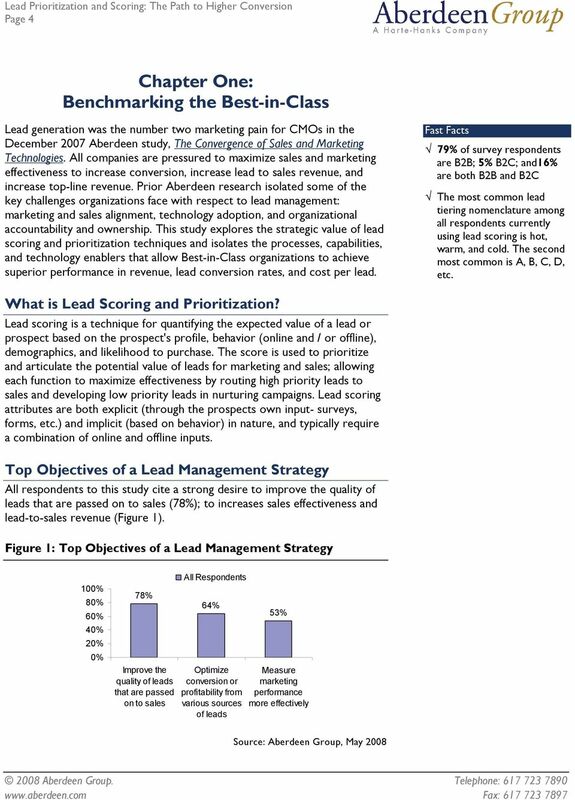 Lead Nurturing The Secret to Successful Lead Generation November 2008 Ian Michiels Page 2 Executive Summary This report outlines the essential role lead nurturing will play in weathering the economic downturn. 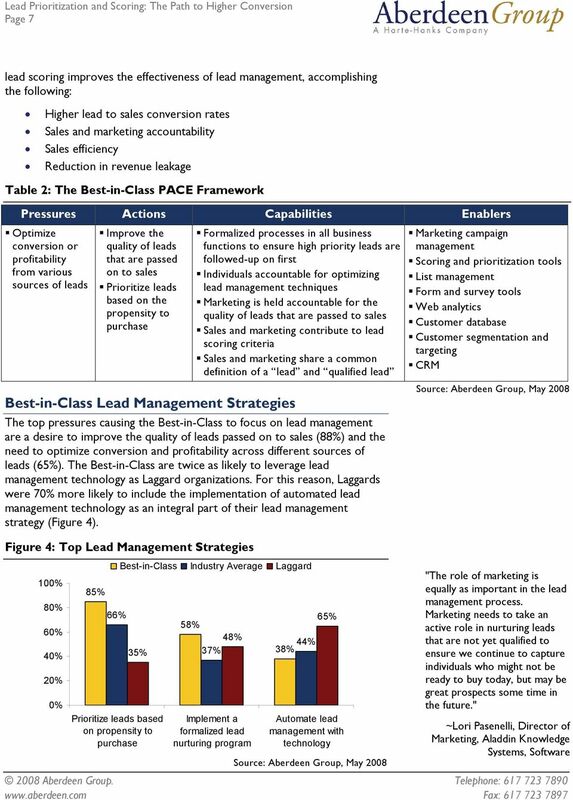 Crossing the Chasm with Automated Lead Management January 2010 Ian Michiels Page 2 Executive Summary Automated lead management technologies are rapidly becoming critical enablers to Best-in-Class performance. 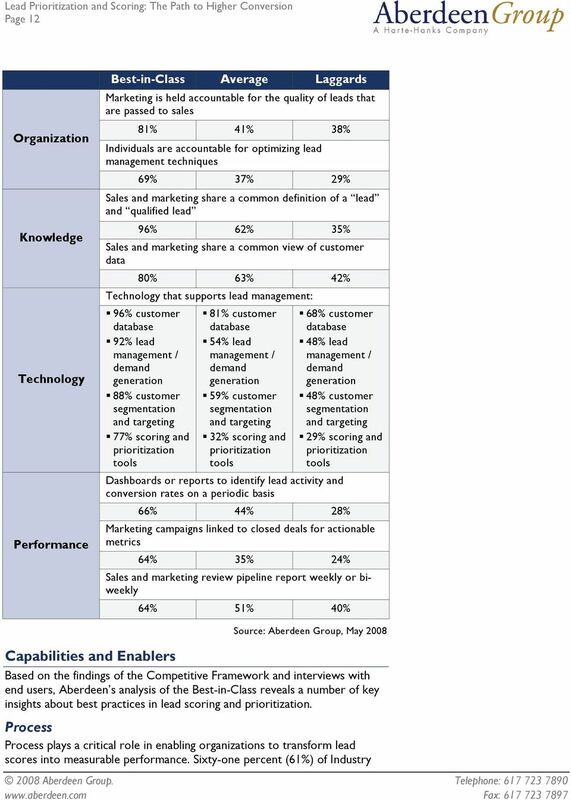 Data Driven Marketing B2B MARKETING AUTOMATION BENCHMARKS FIND. NURTURE. CONVERT. The most challenging obstacles to B2B Marketing Automation success and how marketers will overcome them in the year ahead. MARKETING AUTOMATION & YOUR CRM THE DYNAMIC DUO. Everything you need to know to create the ultimate sales and marketing tool. ERP Selection Finding the Right Fit October 2012 Nick Castellina, Peter Krensky Finding a needle in a haystack is hard, but the task pales in comparison to finding a specific needle in a pile of needles. SalesFUSION White Paper Fundamentals of B2B Nurture Marketing Fundamental Concepts of Nurture Marketing For B2B Marketers explore the basics of nurture marketing (Lead Nurturing) from concept to execution. Transform Inbound Contacts Into Profits: Best Practices for Optimizing Lead Management. The Total Cost of ERP Ownership in Mid-Size Companies July, 2008 Total Cost of Ownership (TCO) remains a significant factor that influences Enterprise Resource Planning (ERP) strategies and decisions. Logical / Physical Security Convergence. Is it in the Cards?